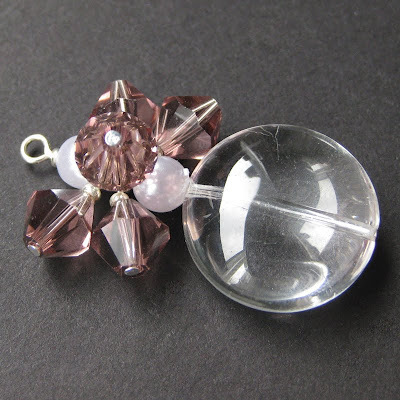 Colorful faceted crystals in shades of purple plums are clustered above a larger crystal clear glass disk that shines like a mystic crystal ball in this charm that can be attached to a phone, zipper tab, key chain, purse and more. It could even be used for a rear view mirror dangle for your car! Are you looking for an eye-catching way to mark your accomplishments and remind yourself of your goals? Here's a beautiful beaded charm that can be used to commemorate a step along your progress to your end goal, whether those steps are five pounds lost, a month sober, excellent grades... you name it! 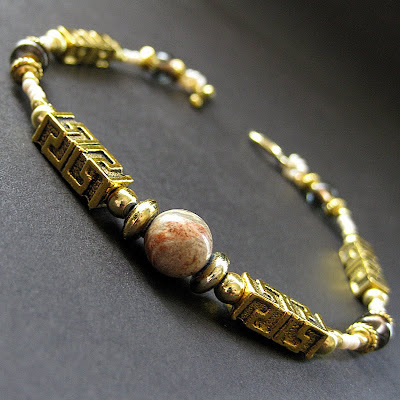 A centerpiece of Rhodonite stone is displayed with elegant perfection by Aztec style gold plated beads and glass accents in this beautiful handcrafted bracelet, the entire piece finished off with a matching toggle clasp. This bracelet is a terrific, classy accent piece, whether dressing up a casual outfit or accessorizing an elegant ensemble. 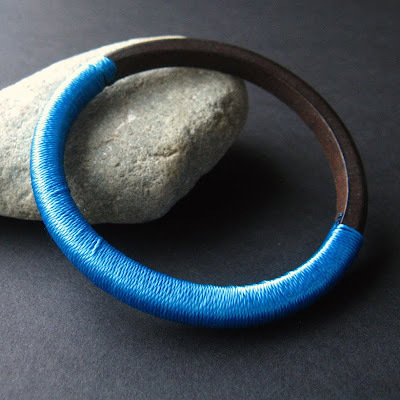 Bracelet measures 8" (20.5 cm) in length including clasp. 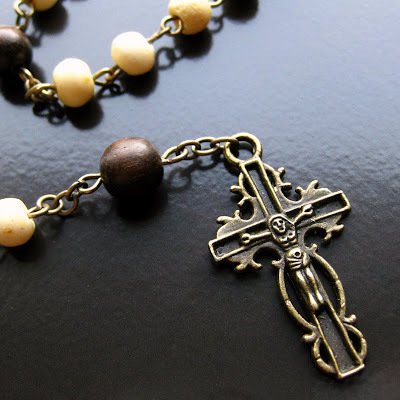 This handcrafted 5-decade rosary has an earthy and traditional feel to it, made of dark wood rounds and vintage bone beads joined together using antique bronze components. The rosary is then completed with a beautifully detailed bronze Sacred Mother centerpiece and an equally detailed bronze crucifix at the end. A beautiful beaded eyeglass chain made from sunny yellow beads that are sure to brighten your day. 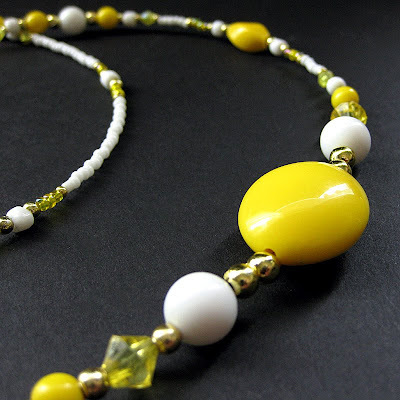 Yellow is joined upon a shimmering white cord off seed beads and accompanied by gold plated accents. You can solve that problem by wearing an eyeglass chain that hooks to the arms of your glasses and lets them dangle securely around your neck. You found the mystery QR-Code for Bits n Beads by Gilliauna. As a reward, receive 20% OFF a purchase in our online shop. 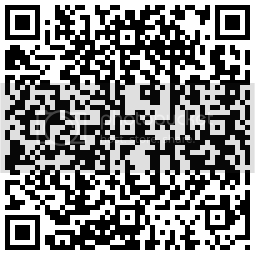 Use Coupon Code QRCODE20 at Checkout to redeem your discount!